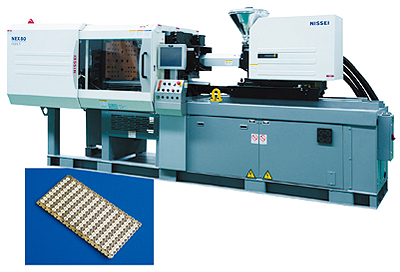 Nissei Plastic Industrial Co., Ltd. will exhibit two electric type injection molding machines in anticipation of increased demand from China at the "12th China Dongguan International Mould & Metalworking, Plastics, Packaging & Rubber Exhibition (DMP 2010)" that will be held in Dongguan, China from November 17 to 20. The function of the East Asian region, which centers around China as the factory of the world, is increasing further in the field of digital and IT equipment, such as notebook computers, liquid crystal TVs, and mobile telephones, and in the field of precision electronic components, including LED chips that are drawing attention as light sources in liquid crystal displays and next-generation lighting equipment. In order to meet the high demand of molders under such circumstances, Nissei Plastic Industrial Co., Ltd. will exhibit two high spec electric type molding machines at the show. 1. Electric type injection molding machine, "NEX80-5E"
This machine is the electric type injection molding machine with a clamping force of 784kN (80 tons) which is our main model for the NEX series. The NEX80-5E manufactured at the Taicang plant which began its assembly operation at the end of last year will be exhibited. At the show, 240-cavity molding of LED bases will be demonstrated using a hoop molding system. Hoop molding usually employs vertical molding machines because it is easier to build in a molding system that includes pre- and post-processes. However, hoop molding that employs a highly versatile electric type horizontal molding machine will be proposed at the show. The molding system that realizes significant space reduction is equipped with the hoop feed equipment and auto reel. The main characteristics of the NEX series are: 1) Higher injection/plasticization precision and expansion of molding area due to adopting low inertia servo motors and our proprietary injection mechanism and control system that optimize high speed injection/response/pressure and the control of temperature heat-up of barrel. 2) Improved yield due to high-precision metering control (able to choose between "pre-packing" or "precise metering" for control settings). 3) "Linear pressure toggle" that achieves characteristics close to direct pressure type mechanism by utilizing the high cycle characteristic of the toggle mechanism. The linear pressure toggle is equipped with the standard functions such as "automatic clamping force adjustment", which automatically adjusts the clamping force that has been changed by the rise in the mold temperature during automatic operation, and "direct clamping force setting", which enables changing the clamping force during automatic operation. 2. 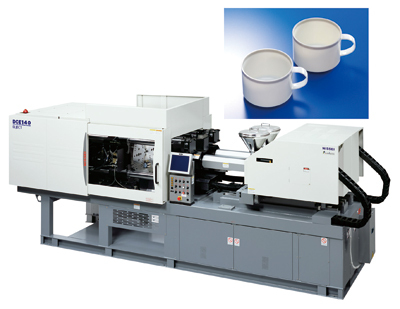 Electric type, two-color/dissimilar material injection molding machine, "DCE140-9E"
This machine is the "DCE series" type with a clamping force of 1370kN (140 tons) that accommodates varying demands for two-color dissimilar materials. At the show, two-cavity molding of soup cups will be demonstrated. The main feature of this machine is the incorporation of the proprietary "Double Flat Clamp" clamping mechanism. This mechanism can transmit clamping force uniformly to the both sides of the mold, enabling precise and stable molding, and moreover, it is also very effective when the projected areas of the product are unbalanced on the primary and secondary sides of the mold such as the soup cup demonstration at the show. Other characteristics are as follows: 1) A high torque servo motor is employed for mold rotation within the clamping mechanism that translates to fast cycling, and also achieves higher rotation speed and shockless mold rotation movement. The rotation time is 0.9 s when the two halves of the largest mold are attached. 2) A clean rotation mechanism that does not employ much grease. 3) Simultaneous molding operations are possible (rotation while opening the mold for example), and this contributes to faster cycle times. 4) A new high-performance mold protection function is incorporated and through "ultra-high speed reaction operation," mold damage can be prevented before it happens. 5) A non-contact rotation and pull-in mechanism is employed in the rotating platen, and this achieves higher precision in the rotating platen and longer life for the machine and mold. The highly rated NEX series injection mechanism is employed as this machine's injection unit and responding to the shift towards thin-walled parts, an injection unit with high injection speed of 300 mm/s is featured as standard. Our company has an excellent track record in distribution since launching the nation's first two-color/dissimilar material molding machine in 1964. Various applications such as similar material molding (same color or different color), dissimilar material molding using compatibility and dissimilar material molding using incompatibility are proposed, including technical support on the two-color mold mechanism that requires profound knowledge.